Nowadays, people think just because I am traveling means I am rich or I have lots of money. I am sharing with you the realities of travel as a breadwinner based on my personal experience. The truth is, I am not nor have a lot of money. I wasn’t born rich nor my parents. Being the eldest and a Filipino, having this close family ties mean you have to help your family when you get the job. Traveling didn’t occur to me until I was 23. Obviously, I wasn’t born as a traveler. I started doing part-time work for six months when I was 18 just to gain experience and to get my first phone. Quit studies and decided to get a job in a BPO company. I only lasted working for 10 months because I got sick. Later on, I decided to focus on working online using my desktop computer in 2010. Before I quit my job, I made sure that I got my online job and worked on my portfolio. When I started working online and earned enough money, I wouldn’t mind if my family or siblings got no job before that. I was the only one who was working and juggling on different clients as a freelancer. I gave my mom a part of my weekly salary and was able to save money on my own. The perks of working at home and being a thrifty person, I never spend too much on expensive things although I bought LCD TV and XBOX 360 for entertainment. I put my money on time deposit, investing in the stock market, and other ways to create a little passive income. My money is not that much, to be honest. Haven’t reach half a million. I was contented and made my family as an inspiration. Related Article: The Revenge Story of How Can a Poor Filipina Afford to Travel? Can You Still Travel as a Breadwinner? It took me several years before I embarked myself a solo travel to 5 countries back in 2015 although I started traveling in some parts of the Philippines as a tourist for as short as three days. Yes, you can still travel as a breadwinner. 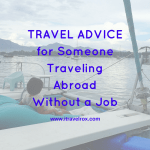 How to Travel as a Breadwinner? When you’re single and have no obligations in life, you better treat yourself good for your overall health and future. But first, you need a lot of preparations before you travel. Save money first for your daily expenses and always create an emergency fund. After the emergency fund, it’s time to build on your travel fund. Related Article: How I Saved 100K PHP to Travel 5 Countries in 2015? You don’t have to travel in luxury but you can travel on a budget. But splurging is okay if you want to be a tourist somewhere. You can also travel within the area especially if you have a nice beach resort in the next town when it is just a bus ride away. An overnight stay or two is good to take a break for the weekend. You can book a flight ahead of time and it’s cheaper. The same time, you can save money along the way for your travel fund. You still have time to do a lot of research on where to go, what to do, which transportation to take, and a lot more. Related Article: Q & A – Why Do You Travel a Lot? How Come You Travel so Much? It feels good helping your family but if you’re the sole breadwinner, sometimes you feel tired. Sometimes you want to be selfish. And this is what I was feeling. You felt so fucked up when one of the family members never help on doing house chores. This was my problem when I was working at home and being the sole breadwinner. I really enjoyed working at home until I got astigmatism. I went to see the ophthalmologist and got a new pair of eyeglasses. Worked from 10-12 hours a day so that I would get bigger money at the end of the week working on multiple clients. With stress, I got an unexpected surgery which cost me money as I had a problem with my breast. Fortunately, the result was benign. My mom depended on me financially as my sister’s job was on and off. My brother wasn’t working and asked for money from my mom. So it seems like my brother was asking money from me indirectly and my mom’s budget turned a mess. I had always told my mom about money matters, about my brother not helping in any way. Not sure if I was being generous but I think I was being stingy. I just know how to hold on of my money. You know, my freelance job is per project basis. I used to have several clients but after my surgery, I decided to stick one or two clients. Sometimes, I just don’t want to work at all, stay relax and travel. Related Article: How a Painful and Traumatic Health Threat Forced Me to Travel More? As a sole breadwinner, I should be lucky because I was able to experience working at home. No commute, no traffic, food is just within reach and I can take a nap in my bed when I feel tired. For how many years, I witnessed what was happening in my home. I saw my parents arguing, my brother being disrespectful, and had a little argument with your sister. You know, this should be normal in a family but it was getting frequent since that time, they were not working. My mom is the housewife. I had problems with my father (deceased since 2015) and brother. I broke up with my ex-boyfriend just because he was getting toxic as well. Working at home was cool until you hear family members yelling at each other. Not cool anymore. I lost my focus and concentration, became agitated, anxiety attacks, working performance at home became a deterioration. What an unhealthy environment. Well, based on my personal experience. To be honest, I just wanted a peaceful environment for me to work. That’s when I started to escape every weekend just to join doing volunteer work in other parts of the Philippines. I just want to save money, do something worthwhile, and avoid conflict in the family. Working at home made me realize I had no socialization with other people. To keep me away from boredom, most of the people I talked to were on Facebook messenger. Then, I started to put up a travel blog, go on blog hopping, getting inspiration from other people how it is possible to travel solo and so on. Related Article: How I Started Travel Blogging? You know, I’m also human and I have my breaking point as well. There was a time I just wanted to pause working on my job and travel. I know, it sounds selfish but being single with no obligation in life made me feel stuck being single. I questioned myself where my life is going to be? What do I look forward to in 5 years? Should I stay single and still a breadwinner? Is my life will be the same? Any improvements in the family? If you want to stop as the breadwinner, you better communicate with your family in a nice way. What’s going to happen? What’s your plan? Your siblings need to keep up and find a job. They should also need to learn how to control their temper (based on experience). Or they need to be responsible in finding a job to contribute in the family. But to be honest, the reason I stopped being the breadwinner was that of my brother. Excuse me, I won’t tolerate abusive behavior in the family. It’s been a year already since I traveled to Palawan and decided to stay longer as I found my peace here. I feel home and safe. For now, I just want to heal myself in and out. Can anyone relate to this post? Any travelers who are breadwinners? Share your sentiments below. Would love to read your experience as well. This entry was posted in FACT Inspire, Money Matters, Tips and tagged can you travel as a breadwinner, travel as a breadwinner, traveling as a breadwinner, truths and realities of travel as a breadwinner, truths of travel as a breadwinner. Bookmark the permalink. Nice blog. Keep doing what you love most and everything will be good in the end. I, myself is a bread winner too. For me travelling is my temporary escape for all my responsibilities. It’s really really hard when you are the only one helping the family finances. Sometimes like others,I feel tired too. I got envious most of the time whenever I see some of my friends doing what they want to do without even worrying about money or obligations on their family. I hope someday I can go to places I always dream of. your blog is very inspiring to a bread winner like me too. Plano ko din na magwork at home para madaming time na kasama ko ang family ko especially my mother. At makakapgtravel ako anywhere without worrying about my job. But I am yet to do it dahil may mga obligations pa at hindi ko rin alam kung papanu magsimula dahil takot din ako iwan ang trabaho ko without any assurance of another job. Maybe one day I will just pull it off.